Do you know how much traffic you need to get for your online store to be “successful” throughout the year? No? What about this holiday season? No? Whoa! I get that flying blind can be a thrill, but if you’re in business for yourself, you need to get your wits about you and set some goals. Without having goals your are far more susceptible to losing altitude without even knowing or when it’s too late. Crash. Boom! We want none of that. Watch this week’s #SellMore video to find out the magic formula to calculate how much traffic your business will need to reach your ecommerce goals. You’ll be far more likely to experience clear skies and fair weather ahead for your small business. After you finish watching, scroll down the page for a deeper dive. Have any idea how much traffic you need for your online store to to be reach your sales goals?” No? — Whoa! Let me show you a simple formula to help you sell more. The following formula is simple. I’ve selected some straight forward numbers to drive home the concept but you can plug and play the metrics for your online business. From there, you’ll understand the number of visitors your specific store will need to hit your sales goals. This formula will also help you identify what metrics and aspects of your business need improving so you can succeed in hitting your target and selling more products online. 1. Set a revenue goal. Be reasonable or be crazy, it’s up to you. My example will be with something simple. Let’s say $100,000/year for my business. 2. Calculate your number of orders. Divide your goal by your average order value. Again, for easy math, I’ll say my average order value is $25.00. This will help you determine the number of orders you’ll need over the course of the year. 3. 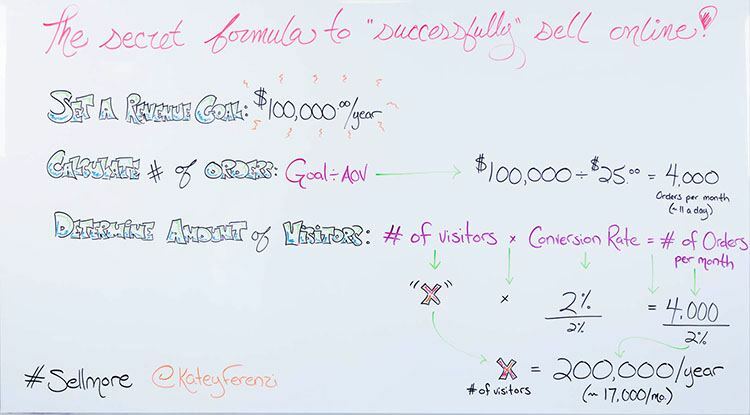 Determine amount of visitors: In order to find the number of visitors needed to achieve this level of sales we need to “solve for x” which we all loved in Algebra. 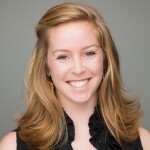 Let’s assuming a 2% conversion rate for your business. So, your total will be 200,000 visitors per year to reach your ecommerce goals. Make sense? This is incredibly important for you do so you have an understanding of your business and know whether or not you’re on target or veering in the wrong direction. If you have questions want to suggest a topic for a future #SellMore video, tweet @Bigcommerce or comment below to let us know! Tune in next week for our next #SellMore video for tips just like this!